Serve this flavorful slow cooker pork roast with potatoes or boiled seasoned cabbage for a delicious family meal. The blend of spices with the apple juice really makes this a mouthwatering meal! Cut the onions in half and cut off the ends; remove the peels. Slice the onion halves and arrange them in the bottom of the slow cooker. Leave the netting on pork roast and place it atop the onion slices in the slow cooker. Slice the carrots into 1-inch pieces. Arrange carrots around the roast; sprinkle the roast with the garlic, salt, pepper, allspice, chili powder, and marjoram or thyme. Combine the juice and vinegar and pour over the roast. Cover and cook on HIGH for 1 hour. Reduce heat to low and cook for 7 to 9 hours longer, or leave on high for 3 to 4 hours longer. Pour juices into a saucepan and bring to a boil on the stovetop. Reduce to medium and continue boiling for 5 minutes. Combine the flour and cold water and stir or whisk until smooth; whisk the flour mixture into the simmering juices. Continue cooking and stirring until thickened. Serve the gravy with the pork. 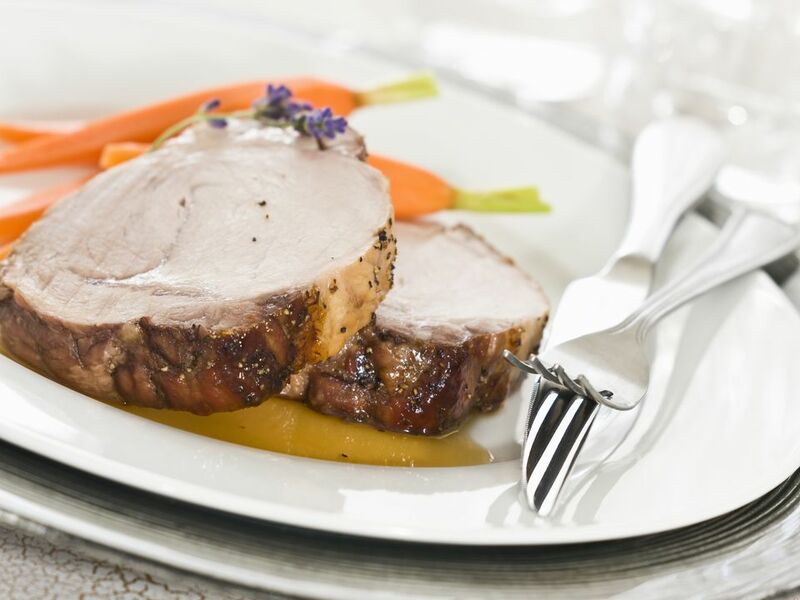 Make the recipe with a pork loin roast instead of pork shoulder. Pork loin is leaner, so it requires less cooking time. Check after about 4 hours on low. According to the USDA, the minimum safe temperature for pork is 145 F. Health Canada advises a temperature of 160 F.
Add small round white or red-skinned potatoes to the slow cooker along with the carrots.